Are You Ready to Love Your Bones and Take Your Health and Structural Strength to a Whole New Level? “Love Your Bones” is a brilliant new book about bone health, addressing how women and men of all ages can take control of their structural system using proven science and the latest developments in cutting-edge research. You are ready to future-proof yourself against an insidious killer. You are committed to embracing a regular routine that will have your bones getting stronger within a matter of weeks. You realise that there is probably a lot more to the bone-health picture than just calcium or vitamin D.
You want to learn how to eat optimally for healthy, strong bones from someone who walks the walk, and has been doing so for over 25 years. You want to understand the role that proper supplementation can play in building a strong skeleton. You are ready to upgrade your lifestyle so that your physical body is programmed towards optimal health rather than degenerative disease. You want to learn how loving your bones can help you to create not just bone health, but improvements in all other aspects of your life. 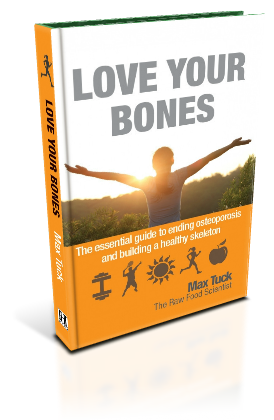 Love Your Bones is an exceptional publication written by Max Tuck, a Veterinary Surgeon, Health Educator and Health Researcher. With a bio-science background, she approaches health concerns from a rigorous scientific stance. After battling her own health issues, and researching and implementing solutions to her mother’s osteoporosis, she was ready to write comprehensively about bone health, offering a programme of nutrition and exercise which, according to published research findings, benefits the whole body. Then Love Your Bones is for you! I’m Max Tuck, and in the summer of 1999 I received a phone call from my mum that changed everything. My mum and I have always been close. At one time people even used to say that we were “tuned in” to each other with our thoughts; I was even born on her birthday. But this phone call seemed to come from out of the blue, and the three words she opened with shocked me to the core. “I’ve got osteoporosis”. As a result of my medical background, I knew exactly what was happening to her, and was familiar with the frightening decline and increasing debility experienced by people diagnosed with this condition. My immediate instinct, I suppose like that of any loving daughter, was that I wanted to fix her. My journey, and exhaustive research, began. Initially, my source of reference was medical journals. But the more I read, the more frustrated I became, since all the information seemed to point towards drug treatments and calcium pills, which, whilst potentially helpful, also appeared to have the significant risk of adverse side effects over time. The published science also seemed to indicate that whilst drugs could slow the progression of the disease, they could not necessarily reverse it. This worried me, because I wanted the best for my mum. I’m sure you can relate to that. What was missing was a comprehensive plan that addressed all of the stages that led to the disease in the first place. I read some very helpful books that seemed to provide some useful pieces of the jigsaw puzzle, but not one of them provided an all-encompassing whole. Via my thirst for knowledge and downright refusal to allow mum to suffer, I found out some interesting facts. Osteoporosis is much more prevalent in Northern Europe, Canada and the USA than it is in less “developed” nations. What were the people of these countries doing that was causing such dramatic bone depletion, whilst increasing the risk of agonising fractures? As it transpires, there are many factors that make the East different from the West in relation to bone health. I was determined to find them all, research their significance, and act upon them. The result of my research is my latest book, Love Your Bones. Love Your Bones has been created specifically for those who want to embrace all these factors that are now known to be essential for bone-building. The book covers the obvious ones that we’ve all heard of, but also opens the door to information on a multitude of bone-health tips you might never have thought to be significant, and might never even have heard of. Wherever you are on the health spectrum, you can start to benefit from all of the upgrades put forward in Love Your Bones. Perhaps you already eat an excellent diet. Find out the essential nutrients you might be lacking, even if this is the case. Oh, and in case you’re wondering if this book is for beginners or advanced scientists, be assured that as in all of my written work, I take complicated science and make it fully understandable for everyone. It’s what I’m known for. In the introduction, I outline the concept of the “Eight Pillars of Health” and the importance of applying all of them to your bone health journey. In chapter 1, I unveil the shocking statistics surrounding osteoporosis and fracture rates. Were you aware that by 2030, the fracture rate in Canada is expected to quadruple? Similar statistics are projected worldwide. Can you risk becoming one of those who ends up with painful broken bones? And whilst you might think that this is a disease affecting only older women, 1 in 8 men over the age of 50 are now being diagnosed with this life-limiting condition. If we know how bones are actually put together, it makes all the recommendations so much easier to follow! Discover how a little-known substance in abalone shell, which is also present in your bones, makes them stronger than you ever thought possible. Learning how to keep this substance active could make all the difference to your long term fracture resistance. Read about the invention of an eminent bone scientist which promises to turn diagnosis of this debilitating condition on its head, and how you can benefit from this knowledge. Chapter 3 | I’m already weaned, thanks! We have always been told that we need milk for strong bones. Could this be wrong? What if milk, cheese, yogurt and cream were not actually bone-building friends? Chapter 3 uncovers some fascinating new research papers that indicate we might have been incorrect to place so much emphasis on these foods. Find out which mineral, so essential for bone health, is lacking in dairy products. Learn about other diseases which are linked to high intakes of dairy foods. Your overall health depends on this! This chapter delves into the benefits of an alkaline-forming diet and dispels some myths about acid/alkali balance. Discover which acid-forming foods and beverages are worst for your skeletal structure, and how they can undermine your entire health profile. Find out which widely-accepted practice could be silently undermining the integrity of your bone tissue. This information will amaze you! Max has a gift to create real clarity around the subject of nutrition and her passion shines through with this book. For any of you that really care about your health, and want to take control of your body’s strength for the future, then this is the book for you. With her unbelievable knowledge about nutrition and health, this book gives you the most up to date and correct information, which would take most people years to research. It is clear that Max wants to share this knowledge to give everyone a chance to change, improve and gain understanding to create the best, most vibrant life possible. It is brilliantly written and explained, and I certainly will be recommending it to all my clients. Knowledge is power! This chapter explains exactly why, as far as bone health is concerned, not all protein is created equal. Learn which type you need and which type you must avoid for healthy bones. Find out how a particular vitamin, so vital for bone health, is inhibited by certain types of dietary protein. The integrity of your structure absolutely depends on this – ignore it at your peril! Do you sometimes wonder if the food industry really has your best interests at heart? Well, here’s some essential reading as I share with you the shocking facts about sugar consumption and how it might interfere with bone strength and development. Discover which hormones are directly activated by sugar consumption and how this wreaks havoc in the body and weakens the bones. Learn why foods that you might currently consider to be healthy could be insidiously undermining your strength. Very few people know about this, but it’s essential if you want build a healthy skeleton. This chapter explodes some of the myths concerning calcium, even though many still consider it to be the most important mineral for bone health. What if everything you thought you knew about calcium, and supplementing with calcium for bone health, turned out to be wrong? The medical profession has not yet caught up with the vital information in this chapter. Get ahead of the game on the calcium story and find out what you really need to do to get this structural mineral into your body. The answer could surprise you. Max is always an absolute pleasure to have on Food for Thought, and Natural Health Radio. She’s considered one of our expert speakers on nutrition, who is a firm favourite with the listeners. Why? Because she knows her stuff, gets straight to the point, is absolutely no-nonsense, and very well researched with the latest findings. She’s a woman who shows her passion about health, and understands how nature balances and heals the body. The message about bone health in the mainstream media is mostly aimed at women, yet men also have to deal with this increasing health problem, caused largely by diet and lifestyle issues. Max absolutely comprehends this and her knowledge helps you to future-proof yourself with diet and lifestyle changes. The bone-health picture cannot be considered complete until you embrace these 8 essential minerals. They are each as important as the next; learn about how they interact with each other and why you can’t just concentrate on one or two. Discover which delicious foods are a treasure-trove of these bone-building superheroes. Read about the mineral that is involved in over 50 known biochemical reactions in the body and be amazed by how it acts to augment your structural health. We’ve all heard about the importance of vitamin D to bone health. Now find out about the essential vitamin that acts in harmony with vitamin D – if you don’t have enough of this, it isn’t just your bone strength that will suffer! Read about the fascinating research that indicates which delicious berries can help you in your quest for strong bones. Understand the relationship between bone health and heart health, via a fascinating nutrient found in plants and certain whole-food based supplements. By the end of this chapter, you’ll absolutely get why calcium pills alone are not the answer. Although this book is called Love Your Bones, don’t be fooled! Max has synthesised the most cutting-edge principles, strategies and wisdom to set you free and allow you to experience phenomenal health. Max walks her talk more than anyone I know, you’ll love her story and personal journey, and to top it all off she has proved the principles work. Also, having known Max for many years, I know her standards are as high as they come, her integrity is second to none, and with that you’d be crazy not to read and master this phenomenal book. Was Granny right all the time? She might not have been. Could it be that the high incidence of osteoporosis in Scandinavia is linked to the consumption of this particular “health” supplement? And why is it that supplementing with something that is supposed to be good for your bones could increase your risk of heart attacks? Which food supplements should you really be taking (and yes, you do need these)? This chapter explodes some common myths, and will also help you to decide which pharmaceutical drugs might be best for you if your doctor has recommended that you take prescription medication. Knowledge is power! How does stress affect bone health? Should I take HRT? Don’t estrogens increase cancer risk? By the end of this chapter you will have a full understanding of which hormones affect your bone quality, which type you should be using (if you are going to use them) and what you absolutely must do before you start any regime of hormone replacement; this applies to both men and women. Your long-term health depends on this – don’t leave it to guesswork! Chapter 12 | Exercise – the key to it all? Of course exercise is essential for bone health, but which type is best? How often do I need to do it? Can’t I just change my diet instead? All the answers are here. I’m not an exercise instructor, so I called upon two experts for their input into this chapter, both of whom have a long history of working with older adults. Find out exactly which exercises are best; follow the illustrations and learn how to do them at home. Discover a simple and inexpensive piece of exercise equipment that is vital to have in your anti-bone loss armoury, and follow the 12 simple exercises shown on pages 153 to 159. Most of these simple exercises can even be done sitting down. Do them regularly and you can increase your bone density by up to 10% in just 12 weeks! Max is the busiest person I know, combining her high-pressure work in a large veterinary practice with an ever expanding nutritional consultancy; teaching courses, running retreats, giving lectures, writing articles and newsletters, keeping her web site up to date, writing books and maintaining her fantastic state of health and fitness with an incredible exercise regime and the perfect plant-based diet. She absolutely leads by example. 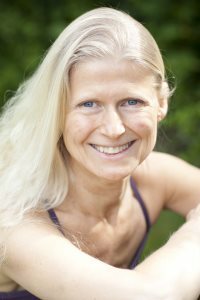 With a wealth of information at her fingertips, Max explains with extraordinary clarity and great humour the well-researched, scientifically-proven facts concerning bone health, nutrition and fitness. She is a mine of knowledge and practical advice. Follow Max's advice and her shining example and you cannot help but enjoy abundant health, energy and vitality. Sounds great Max, but what exactly am I supposed to eat? I’ve got it covered... Whilst I was researching for Love Your Bones, I came across some excellent books published on the subject of osteoporosis; after all, this is a much written-about condition. However, none seemed to put everything in the one place. That’s what makes Love Your Bones different from anything you might have read before; in addition to all the essential information outlined above, I’ve included over 40 pages of recipes for you to enjoy. Simple, wholesome, mineral-rich, bone-building food that will immediately set you on the path to better health and strength, and, in time, supercharge your life! Wrapping up, you won’t want to miss the unique “A day in the life of a bone-lover” section, starting on page 167. It walks you through a bone-building day from the moment you wake up to the moment your head touches the pillow again. It’s as if I’m right next to you, guiding you through your day as you embrace all the concepts outlined in Love Your Bones, powering up your innate healing mechanisms and giving your precious skeletal structure exactly what it needs to regenerate! Max Tuck is one of the UK's leading experts on health and nutrition, and a shining example of what she teaches. If you want to protect your bones while also enhancing every aspect of your health and wellbeing, get your copy of this gem of a book, and follow her recommendations. As I’m sure you’ve now realised, Love Your Bones is no ordinary book. And by reading this far, you’ve shown that you’re no ordinary health-seeker. You know there’s got to be a better way to protect your structure than the current paradigm. You appreciate that your doctor might not be aware of all the latest developments in nutritional science that support bone health. If you are ready to learn how to free yourself from the shackles of this potentially crippling disease, this is the place to say “YES”.